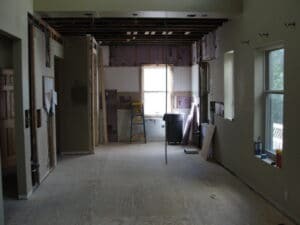 Titus Contracting is happy to share yet another fantastic St. Paul condo remodeling project with you! 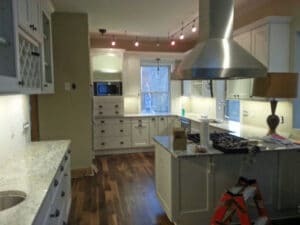 We have been working on a kitchen upgrade for a condo located in St. Paul. We enjoyed this project and wanted to show off some before, during and after photos! 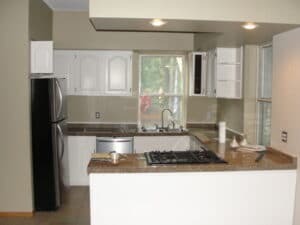 When this was completed, we put in some lovely new hardwood floors, cabinets and countertops. We think the hardwood floors really helped tie everything in this St. Paul condo kitchen together. The hardwood floors are easy to clean and maintain, which is especially important in a kitchen! It is easy to spill things on the floor, so it is important to have one that is easy to clean and take care of. And, finally, we were able to install brand-new appliances. We hope the St. Paul condo owner likes to cook – this kitchen will be the envy of any chef or baker out there! It’s nice and spacious and has some incredible natural light shining through it. There is ample counter space and there is plenty of space to move around, so more than one cook can be working in there if need be. We also thought the lighting along the ceiling near the cabinets was a nice touch. 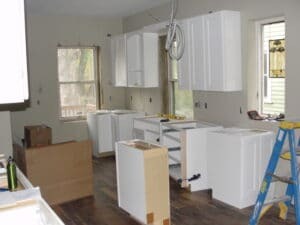 If you’re a St. Paul condo building owner or building manager and are looking to have kitchens remodeled, give us a call at (952) 746-7817 or contact us online for a free consultation!